In a statement accepting the ACD’s recommendations, NIH Director Francis Collins pointed to the need to remain nimble and adaptable as the Initiative progresses. The agency intends to move quickly to build the necessary infrastructure so that participants can begin enrolling in the cohort in 2016. The long-term goal is to enroll at least 1 million participants in three to four years. The Working Group identified a number of “high-value scientific opportunities or use cases” that could be used to inform the design of the PMI cohort, including: development of quantitative estimates of risk for a range of disease by integrating environmental exposures, genetic factors, and gene-environment interactions; identification of determinants of individual variation in efficacy and safety of commonly used therapeutics; discovery of biomarkers that identify people with increased or decreased risk of developing common diseases; use of mobile health (mHealth) technologies to correlate activity, physiologic measures, and environmental exposures with health outcomes; determination of health impacts of heterozygous loss of function mutations; development new disease classifications and relationships; empowerment of participants with data and information to improve their own health; and creation of a platform to enable trials of targeted therapy. 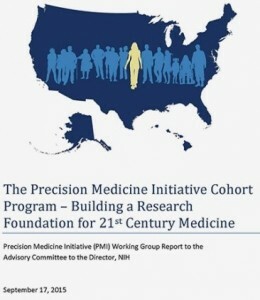 The report notes that these scientific opportunities “will be explored in stages throughout the life of the PMI cohort and should not be considered as an exhaustive list.” The expectation is that as the richness of the data increases and new technology is developed, additional potential use of the cohort will become apparent. The Working Group provides both major and minor recommendations to guide the assembly of the cohort. Cohort Assembly: The Working Group recommends that all potential participants in the PMI cohort must agree to share their health data, provide a biospecimen, and be re-contacted for future research. It also recommends that the PMI cohort reflect the diversity of the U.S. Participant Engagement: The Working Group recommends the PMI cohort be developed using a highly interactive and proactive participation model, where cohort participants are encouraged to engage in all aspects of the cohort. In addition to providing feedback and input during planning and implementation phases of the cohort, participants should have significant representation on PMI-CP governance and oversight committees. The Working Group also recommends that a set of guiding principles that apply to all PMI cohort stakeholders be developed, along with the creation of a central entity to manage it; a standardized consent protocol to ensure consistency; PMI-CP return to each participant their own results and aggregated results from its studies to all participant; and the assembly of a subcommittee with significant participant representation as part of the PMI-CP governance structure. Data: The Working Group recognized that the cohort will require a combination of “well-proven and innovative methods and technologies” for data collection and management. It recommends that the initial core data set acquired from all PMI cohort participants be collected and stored centrally. It is also recommends that the PMI-CP seek to align its core data set with other comparable core data sets where possible. The recommended initial core data set includes data from electronic health records (EHRs), health insurance organizations, participant surveys, mHealth technologies, and biologic investigations, and would be expected to grow with time. A common data model is also recommended that would allow for efficient structuring and management of data. Where possible, the Working Group recommends that existing data standards and common data models be leveraged while recognizing that standards do not exist for many emerging modalities. Regarding data security, the Working Group recommends a data access control approach appropriate to the level of sensitivity of the data, from open-access for summary data, to role-based access for individual level data. Governance: The Working Group recommends that the PMI-CP be led by a director “with the institutional authority, professional expertise, and structural support to provide strong, credible, and effective leadership.” It also recommends the creation of a steering committee of critical stakeholders led by a smaller executive committee and five subcommittees that would report and inform the work of the steering committee and PMI director. The five subcommittees would address return of results and information, data, resource access, biobanking, and security. An independent advisory board to provide external oversight is also recommended. It is also recommends that NIH develop a “mechanism” to ensure that the governance structures for the PMI-CP are coordinated with other federal agencies while maintaining NIH’s final responsibility for the PMI-CP. NIH has appointed National Center for Complementary and Integrative Health director Josephine P. Briggs as the interim director of the NIH Precision Medicine Initiative Cohort Program while a search for a permanent director is initiated. Biobanking: The Working Group recommends that each PMI cohort participant should provide a new blood specimen that would be sent to a central biorepository. It also recommends that the biobank should be in place before the start of recruitment. For additional information, see: White House Precision Medicine Initiative, NIH Precision Medicine Initiative, Advisory Committee to the NIH Director, or NIH Advisory Committee to the Director Precision Medicine Initiative Working Group.